Every time someone comes to visit me from the States, protocol dictates that I take them on a food tour of England. Even though London now has one of the most progressive, diverse food offers available in any city, it is the classic British spread that people are always after: fish and chips, bangers and mash, a full English breakfast; and traditional roasts with Yorkshire puddings followed by desserts such as trifle, Eton Mess and sticky toffee pudding. These are all must have dishes on any tourists menu. As someone that has always worked in the food industry, people have an expectation that I will be able to guide them on their culinary adventures with aplomb. This is where the problem usually begins. Where do they want to go? Do they want to try the latest restaurant, pop-up, or street food stand? No. In their eyes, it has to be the iconic English pub. England is, deservedly, famous for its pub culture and pubs still hold their spot as the social hub of British culture. When it comes to food, however, pubs are not necessarily at the forefront of quality cooking. I’ve never wanted to use this blog to criticise businesses, but more as a way of celebrating those that do a great job, however, the pub scene has to be my greatest frustration when it comes to food. I’m not saying that there aren’t a huge number of quality establishments. Small batch breweries and real cask ales have had a revolution in recent years and the public is becoming more and more discerning. The gastropub movement has continued to grow throughout the nineties and the noughties and, if you’re in the know, you can find some of the best food on offer in the right pubs. A renaissance of classic values is really starting to take hold, with many pubs offering micro brewed beers and home grown or locally sourced produce with exciting menus showing a real devotion to freshly prepared, home cooked meals. If you want to get away from bland commercial lager, horrible wines by the glass, microwave ready meals and Aunt Bessie’s Yorkshire puddings, there are now many viable options. There are now even Michelin starred pubs like the Hand and Flowers and the Harwood Arms where you will find some of the best British cooking available. That, however, is where the problem lies. Picking the right pub is like playing Russian roulette. I was on a weekend in Somerset recently and decided to take my chances with some spontaneous choices. Nothing sounded better to us than walking the dog through the beautiful countryside before satisfying our appetites in a cosy pub, maybe sitting next to a fire. It didn’t take long for us to find what we thought was the perfect place. We came across a medieval village called Dunster. It doesn’t come much quainter than this. Dating back to 700AD with over 200 listed building, there is a tiny, quiet high street nestled between the ancient Dunster Castle overlooking it from a hill to the west and Conygar Tower overlooking it from a hill to the east. Here, we discovered a pub that had all the makings of the perfect pub. Old warped, wooden beams, a warren of little rooms, each cuter than the last, three different fire places, loads of original features, some local award winning ales on draft, a chalkboard with some of the daily specials and a small daily menu with some of the items sold out. It was dog friendly, had a separate, busy restaurant and a 28 room hotel, friendly staff and a buzzing atmosphere of what seemed like locals in the various rooms of the bar. How could it go wrong? It went very wrong. The first three dishes I ordered were either not available on Sundays or sold out. I opted for the roast pork in the end. I won’t go into all the details, but the meal was a miserable disappointment and my wife and I left feeling as if we’d been tricked. My dog, however, was very happy, as she had an unusually large amount of leftovers to snack on. It really is so hard now to tell which ones are going to be good or not. Don’t think the décor will help give it away. Of course, there are the obvious things to watch out for. If the pub is part of a large chain, you’re likely to find that the guys in the kitchen are working with no more than a pair of scissors and a microwave. Laminated, generic menus with photos of food are another easy tell. Overly generous promotions… “Two meals for a fiver”, often shows you the venues that are much more interested in the drink spend then repeat diners. Yes, there are many ways to spot the bad ones; however, they are getting better and better at masquerading more. Clever employment of chalkboards with changing specials, guest cask ales (still produced on a massive commercial scale), rustic wooden boards to display food on and paper menus that look like they get printed daily are all tricks meant to trick the most discriminating customers. 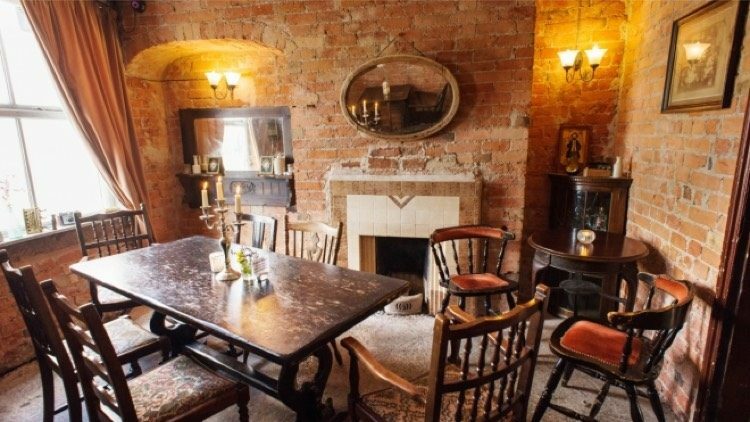 Old wooden beams, a cosy fireplace, historical photos, assorted antique bric-a-brak on the walls and shelves and eclectic old furniture are all just part of the illusion. Its fine if you know the area or have time to research things online, but as soon as you lose these advantages, your odds of chancing on a pub with great food aren’t great. So let’s help each other out. All of you that have a recommendation for a pub where you can get great British food, please let us know about it. Starting from today (20th March) for a month, anyone that wants to share their examples of the best British food pubs on our Facebook page will be entered into a prize draw for a Magnum of Champagne. This is not an invitation to name and shame the bad ones. In fact, we don’t want any aspiring critics using this as an opportunity to tear into their most recent disappointment. We only want food heroes to feature in this. So if you’ve found a gem, avoiding the traps, dodging the pretenders and refusing to be fooled by the smoke and mirrors that so many of us have fallen victim to, tell us all about it. There’s a lot of great work out there that deserves to be recognised.